This year's affordable Silver Dollar Proof Set features a pure silver dollar commemorating. The second war of American Independence! The Royal Canadian Mint is releasing a multi-coin program. To remember the War of 1812, which was, in effect, a second War of Independence for the nascent United States that's right, we had to fight for our freedom. For Americans, mention of the War of 1812. Conjures up images of the Star Spangled Banner flying over Fort McHenry, frigate duels on the high seas, the burning of Washington, D. (and the White House), and Andrew Jackson's smashing victory at the Battle of New Orleans. For Canadians, the war helped begin to establish a national identity, as Native Americans. And Canadian militia fought alongside British regulars to repel multiple American incursions into Canada. Commemorate the 200th anniversary of the War of 1812 with this low mintage, silver dollar. The mint has not only lowered the mintage limit (see below), they have also significantly lowered the price over last year's proof set! The Maple Leaf penny is now struck in solid copper! - The coins are now struck in solid nickel: 5¢, 10¢, 25¢ and 50¢! Dollar is now struck in solid brass! - The polar bear toonie has a solid brass outer ring and solid nickel core! Lowest mintage limit ever for this annual release - only 40,000! That's a whopping 5,000 less than last year! Compare that to the mintage of U. Proof sets some in the millions! We recommend not delaying, and believe that this silver dollar proof set will sell out. A quick sell out at the Mint is anticipated! 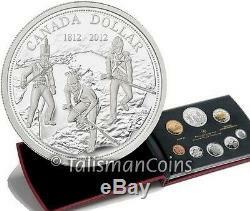 The Mint has released an outstanding program of coins in honor of the bicentennial of the War of 1812. Including several numismatic silver dollars. All feature a dynamic, military design. Design is available in 3 different varieties, included among these program options: Silver Dollar #1 - A Brilliant Uncirculated Pure Silver Dollar. In presentation case Silver Dollar #2 - A Proof Pure Silver Dollar. In presentation case Proof Set #1 - The low mintage, 8-Coin Silver Dollar Proof Set. (with the same proof silver dollar as above) Proof Set #2 - The even-lower-mintage 8-Coin Pure Silver Proof Set. With special gold-plated War of 1812 silver dollar. Ultra-rare, mintage of 600 Indian Peace Medal 1 Kilogram Ultra High Relief Silver Proof. And don't forget the. Pure Silver Dollar with Color. The victor of several War of 1812. Battles against British ships, during which she earned the nickname "Old Ironsides"! Designed by Ardell Bourgeois, the silver dollar. Found only in this Proof Set highlights the role of multiple combatants in defending the British colonies in Canada. Superimposed on a map of Upper and Lower Canada in the Eastern Great Lakes region, three soldiers a sergeant in the British regular army, a Native American. Iroquois warrior brave, and a Voltigeur Canadien or militia, all in historically accurate uniforms, guard the border with unity of purpose to defend the colonies they represent. The annual Silver Dollar Proof Set. Includes a full-proof-finish example of each and every one of the circulation coins of Canada, each of which features a design of national importance, including: One Cent Maple Leaf Penny Five Cent Beaver Nickel Ten Cent Bluenose Schooner Dime Twenty-Five Cent Caribou Quarter Fifty Cent Coat of Arms Half Dollar One Dollar Common Loon "Loonie" Two Dollar Bi-Metal Polar Bear "Toonie" All of these coins above including the penny and loonie. Every coin is struck with the Mint's proof finish, with frosted cameo devices and dark, mirrored fields (or background). Each Silver Dollar Proof Set also includes a pure silver. This year the proof set dollar commemorates the bicentennial of the War of 1812. This special silver dollar found in this set is also available singly in both proof and BU versions, available separately. The War of 1812 - The Canadian Perspective. In the United States, battles such as the Battle of New Orleans of 1815 and the Battle of Baltimore of 1814 (which inspired the lyrics of the United States national anthem, "The Star-Spangled Banner") produced a sense of euphoria over this "Second War of Independence" against Great Britain. It ushered in the "Era of Good Feelings" in which partisan animosity nearly vanished. For Canadians, the War of 1812. Does not figure as large on the national landscape, but still represents a rich historical moment steeped in both fact and myth, complete with heroes and villains, glorious victories and disastrous defeats. While the conflict did not predestine the emergence of Canada as a nation, outcomes like the sustained sovereignty of British North America and the collaborative experience of resisting American forces would eventually help to feed Canadas transition from British colony to dominion to independent nation. English colonists, French Canadiens and Native Americans. Alike recognized that American invasion threatened their own independence and way of life. The War of 1812 was hard fought on both sides for two more years, over which time some of Canadas proudest moments arose. The hard lessons learned in the War further strengthened the physical and economic ties between Upper and Lower Canada, promoting greater colonial unity. More viscerally, the conflict spawned shared stories and heroes that represent a common thread in the histories of all of Canadas founding peoples. This year the mint has imposed a strict. Mintage limit of only 40,000 on the annual Silver Dollar Proof Set. 5,000 less than in 2011! In addition to lowering the mintage limit, the Mint has also decreased the price significantly versus the 2011 Proof Set! The reverse of each coin features Her Majesty, Queen Elizabeth II of England. This portrait, the fourth effigy of the queen to appear on Canadian coinage, was executed by the artist Susanna Blunt. The legend ELIZABETH II D. REGINA ("Elizabeth II, Queen by the Grace of God") and mint mark also appear. The coins are sealed a sturdy plastic lens, elegantly presented inside a large, burgundy-leatherette book lined with black velvet and protected by a black outer box. An individually-numbered certificate with full specifications accompanies the set. 4 Dollars and 91 Cents. Ardell Bourgeois (War of 1812 dollar). Talisman World Coins and Medals has been in business for more than 20 years and is one of the largest world coin direct distributors and wholesalers in the world. The item "Canada 2012 8 Coin Proof Set with War of 1812 Bicentennial $1 Silver Proof Dollar" is in sale since Thursday, December 13, 2012. This item is in the category "Coins & Paper Money\Coins\ Canada\Commemorative". The seller is "talismancoins" and is located in Saint Louis, Missouri. This item can be shipped worldwide.